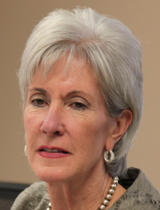 / Modified oct 25, 2013 2:37 p.m.
Sebelius says 700K applications have been submitted for coverage through online exchange, despite flaws. Health and Human Services Secretary Kathleen Sebelius, on a visit to Phoenix Thursday, promised fixes to the website for Affordable Care Act insurance exchanges. The site has been plagued with problems since its launch Oct. 1, leading to frustration among those seeking health coverage under the law and a congressional inquiry that got under way this week in Washington. "I know that it's very frustrating," Sebelius said at a Phoenix news conference. "It's certainly not what we want it to be. It's not the experience I had hoped for, but we won't stop until that lane is wide open and everybody can enroll." She said the administration is adding technical support and working with with its contractors to address the problems with the site. Despite the troubles, Sebelius said, 700,000 people have been able to submit applications online nationwide. While in Phoenix, Sebelius toured a call center that handles questions for people trying to sign up for the federal Health Insurance Marketplaces, and she spoke with those helping people navigate the online exchanges. She said under the exchange, Arizona has some of the lowest health insurance rates in the country. Arizona Gov. Jan Brewer opted out of the state running its health insurance exchange under the Affordable Care Act, so the federal government is doing so, as it is in numerous other states.